You can use our aluminum T-slot track and our hold down clamps to build jigs, fixtures, and hold down devices. Our 5/16" deep x 3/4" wide T-slot track attaches with #6 wood screws. 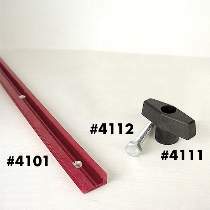 T-slot track accepts standard 1/4" x 20 hex bolts. (Wood screws and bolts are not included.) Wing knobs are available separately.